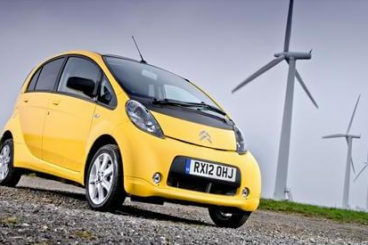 Looking for an objective review of the Citroen C-Zero Hatchback? OSV have got you covered, from engines to lease deals. Sick and fed up of spending more than you feel is necessary on fuel as you go to work and back? The new Citroen C-Zero Hatchback could be a happy alternative. This was one of the first green-minded cars to be given a grant by the government. It was in a bid to entice more people over to the green side. Naturally, it needed more than just £4,500 knocked off its asking price to convince us: As well as being good for the environment, it’s also super duper cheap to run. As well as comfy, and right at home in the city. It’s almost like any other city car, except it’s making more of an effort to save the planet. It comes with four doors and a cracking boot. Car share anyone? It does, however, still command a fairly high asking price (£17,000), while you may as well take a snooze while it recharges. It takes ages. Is it worth it? OSV takes a close look at the perky new car with our 2017 Citroen C-Zero Hatchback review. Citroen as a brand have been associated with the environment for quite some time now. The first ever electric variant of their Berlingo model was launched in 1996, while its sibling company Peugeot delivered the 106 a few years back. However, these were largely prototypes compared to the high standard of EV’s being produced today. And because the standards are now so high, cars like the C-Zero Hatchback have to raise their own game. They are even better to drive and even cheaper to run. 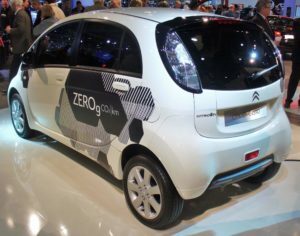 The C-Zero is derived from the old, no longer existing Mitsubishi i-MiEV, while it also takes some of its cues from the Peugeot iOn. It’s powered by an electric motor which can develop up to 66bhp, and which is backed-up by lithium-ion batteries. It can travel up to speeds of a dizzying 80mph, and can go for up to 93 miles on a full charge. However, recharging takes up to 7 hours if you want a full battery. Moreover, you won’t be able to get 93 miles out of it all the time. How many miles you get depends entirely on how you drive it. Or – because we hardly expect C-Zero Hatchback buyers to be the type who rag their cars – more to the point, it depends on when you drive it. For example, if you take the small car out on a frosty night, you’ll have to warm things up with the air-con and main beam. These will take their toll on the battery. Performance is perky, but no more than that. It’s great to drive around the city in. It feels quick until you get to around 30mph, at which point you’ll need to start working it harder. It can get you from a rest to 62mph in almost 16.0 seconds, which sounds sluggish. The steering is surprisingly responsive and sharp, while ride quality is helped by soft springs. Inside, the new car is pretty much just like a regular city car. Four adults will have plenty of space to move around thanks to the high roof, and it’s got four doors and a good-sized and usable boot. Visibility is fantastic, while its tight turning circle means it’s easy to park and manoeuvre tight turns in the city. What marks it out from a regular city car is its whisper-quiet cabin, aided by the fact that there is next to engine noise. Okay, technically there is no engine noise at all, but once you really put your foot down and go beyond 30mph, you’ll be met by a bit of a screech from your electric motor. Meanwhile, tyre noise does find its way into the cabin, and it’s hardly a pleasant noise. The most impractical aspect of the car is its charging time. You can’t use household extensions, which means you have to plug the 5-metre charging cable into a mains socket. As such, there are only certain areas where you can charge it, so you have to map your journey carefully to make sure you don’t get stranded. The boot, meanwhile, measures 166-litres which is reasonable for a car of this size. You can also fold the rear seats flat for even more space. Standard kit is really no different from a conventional city car, and includes electric power steering, air conditioning, folding mirrors, automatic headlights, and a useful tyre pressure monitoring system. If you want sat-nav and a better stereo, though, you will need to pay extra. The car is based on the old Mitsubishi i-MiEV, whose electric drive-train was tested extensively by the Japanese company to ensure its design is as reliable as possible. Citroen have re-tested it, and no new reliability issues have arisen. It’s also been put through its paces by EuroNCAP, and scored 4/5 in its crash test. Prices for the new car start out from just under £17,000. For more information on our leasing deals, you can check out our page here. Once you buy a car like this, you don’t need to worry about fuel costs ever again (or until you go back to a regular car anyway!). You will still need to pay to charge the batteries, but a full charge costs just £2. On a full charge, the C-Zero can go for 93 miles. To put that into some perspective, to get the same results from a petrol car, you would need to pay five times that amount. The C-Zero is also exempt from road tax and the London Congestion Charge. Some electric motors start to whirr and screech once you get them up to speed, but this is one of the quietest on the market. It’s not massively spacious, but there is a good amount of room available for four adults as you potter about the city. Four people car share anyone? Not exactly a benefit exclusive to this car alone, but the C-Zero Hatchback is one of the cheapest ways to commute to work and back ever. It’s cheap to run, but like all electric cars at the moment it’s expensive to buy in the first place. When deciding between this and a much cheaper petrol or diesel-based city car, you’ll have to work out where your financial priorities lie at the moment. It’s dull to drive. Like, really. Let’s see how the car fares against its rivals in the comparison section of our 2017 Citroen C-Zero Hatchback review. 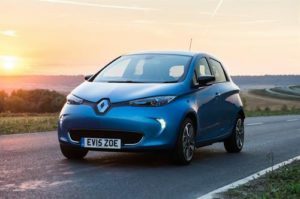 You can often tell when a car is electric just by looking at it, but the new Renault Zoe Hatchback for once doesn’t stick out like a sore thumb. Were it not for the zero emissions and the fantastically quiet motor, you’d think it was a normal city car. Indeed, the Zoe feels really normal. Is that a good thing? It depends on your reasons for wanting an EV. Its steering is precise and light, and the overall driving experience is relaxing and comfortable. Moreover, it’s really quiet on the go. It’s also quite nippy, and coasts its way from a rest to 62mph in just 4.0 seconds. While that won’t be giving a sports car something to think about any time soon, it ensures that the Zoe is able to skip in and out of traffic with ease. Meanwhile, 0-62 is taken care of in 13.5 seconds, and it maxes out at just 84mph. However, as good as the car is in the city, it’s bulky batteries do make body roll a bit of an issue by virtue of the fact that they add so much weight to the car. Moreover, they also put a dent in its performance. The regenerative brakes are a good idea in theory, but they’re abrupt to the point of being startling. Visibility is good though, and the car is easy to park. Like other car makers, Renault is working hard to improve battery range, but the batteries are still expensive. Once you’ve got beyond the initial listing price, you then have to think about the cost of buying or leasing the battery itself. 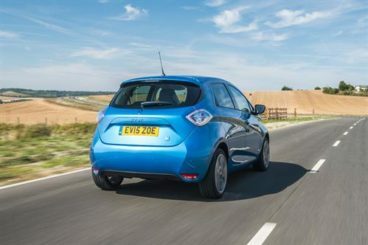 You can do either with the flexible Zoe, and a thirty-six month battery lease will set you back £45 each month if you’re not planning on going beyond 4,500 miles each year. If you’re a high-mileage driver, 10,000 miles + per year will cost you £99 per month. A full charge, meanwhile, costs £3, which we think represents very good value for money. Inside the car, the fact that the electric motor emits next to no noise means the cabin is a serene place to be until someone starts singing. After the eerie silence, the dash is the strongest giveaway yet that this is an electric car, looking every inch like it’s from the year 2050. However, we can’t help but think that Renault missed a trick by pairing up with futuristic design with some rather bland beiges and greys. The batteries are neatly tucked away beneath the seats where a petrol tank usually hides the fuel tank, and this clever move saves you rear legroom and boot space. The boot measures 338-litres, makes it bigger than the one in the Clio, despite the two cars sharing the same width measurements. You can fold the rear seats to extend the boot space, but you can’t fold them totally flat. Never has a battery-powered car had a more obvious name than the Peugeot Ion Hatchback. 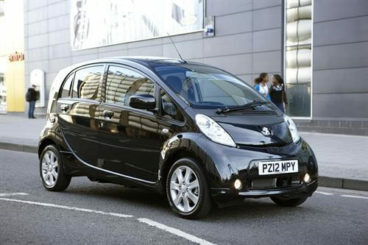 Despite sharing its name with an actual battery, the Peugeot Ion is excellent in the city, where it’s quick and quiet. The iOn is based on the old Mitsubishi i-MiEV – it’s basically little more than a rebadged, re-hashed version. And because the i-MiEV was designed to tap dance its way around the busy streets of Tokyo, the iOn is equally at home in congested British road. It’s nimble, agile and sprightly. Power is instant too, thanks to the fact that its torque is delivered in one go once you thumb down on the accelerator. It can keep up with traffic easily, there is little body roll, and the powerful brakes suit the car perfectly. And because the car gets just the one gear, it’s really smooth to drive. Charging the batteries in full will only cost you £2, which seems like a pittance compared to what it costs to fill up a regular car. The batteries can last for 93 miles on a full charge. 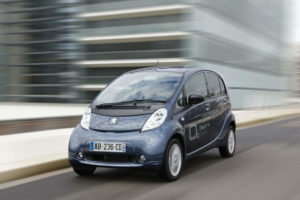 You can fill the Ion up at Peugeot dealers where charging up to 80% takes just half an hour. The Ion is free from road tax and the London congestion charge, as well as parking. As a bonus, it comes with an 8 year warranty. All good so far. The interior is where the wheels start to come off slightly. Don’t get us wrong – this a comfy interior for four people. Headroom is good, and so is the driving position. But the motor is noisy once you get up to speed, while tyre noise is also a problem. Moreover, the interior is just so basic and bland. It’s grey and hardly futuristic. And while four adults can sit in comfort on short journeys, there’ll be complaints from the rear if you keep people in there too long. The boot measures just 166-litres, and can be extended by the folding the rear seats flat. This is really easy to do. If you’ve seen Peter Kay’s Car Share, this is the kind of car that’s ideal for a driver, one passenger and some cheesy radio music as you mend your way to work. The best thing of all, though? You won’t have to worry about asking for the other persons share of the fuel cost (not unless you wanna split hairs over two quid). Sure, it’s a bit dull to drive and it’s expensive to buy outright. 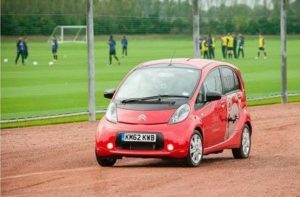 But if you want to make long-term savings while doing your bit for the planet, the new Citroen C-Zero Hatchback makes great sense.